Sunshine Academy Participates In A Number Of State & Federally Sanctioned Programs. Sunshine Academy is becoming a household name for quality Early Childhood Education. As Nationally Accredited schools, we are recognized for our superior administrative and educational programs. "NAC Accreditation offers early care and education programs the opportunity to demonstrate and document quality performance using research-based criteria. NAC accreditation values the rich and diverse tapestry of early care and education programs and the uniqueness of each. The process is designed to be easy-to-understand and achievable. Developed for early care and education professionals by early care and education professionals. Promotes professionalism and program quality. Comprehensive performance standards and evaluation for all program components: Administration, Curriculum, Interactions between Staff and Children, Parent Communication, and Health and Safety. Fully operational in centers across the nation. Respects individual program autonomy and philosophy. Included in government-funded quality enhancement initiatives." CCAMPIS provides low income students who are Pell eligible and are in pursuit of post secondary education access to affordable, accredited, and conveniently located child care services. 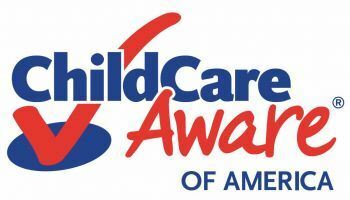 "Child Care Aware© is the nation's most respected hub of information for parents and child care providers. A program of Child Care Aware® of America, Child Care Aware® helps families learn more about the elements of quality child care and how to locate programs in their communities. Child Care Aware® also provides child care providers with access to resources for their child care programs. Our toll-free referral line is staffed by highly-trained and friendly Child Care Consumer Education Specialists who offer both parents and providers invaluable information about child care, and referrals to local Child Care Resource and Referral agencies where they can receive individualized assistance. The Child Care Aware® website is one of the most visited and trusted destinations for parents seeking child care. By providing reliable information about quality child care and referrals to community resources, Child Care Aware® is a critical national link between parents and child care providers." Championing the enormous positive impact of early learning. " " The Early Learning Coalition of Flagler and Volusia Counties (ELCFV) works in conjunction with private, faith-based and public school programs serving children from birth to five years old. Our local Coalition serves Flagler & Volusia Counties. The ELCFV seeks to assist parents with the goal of increasing their child's chances for educational success. A sound education begins with high quality school readiness/ VPK services. The Coalition recognizes that parents are children’s primary first teachers, but also recognizes that by participating in quality school readiness/VPK programs children will be better prepared for school." "VPK stands for the Voluntary Prekindergarten Education Program. If you live in Florida, and your child turns 4 four years of age by September 1, your child is eligible to participate in Florida's FREE Voluntary Prekindergarten (VPK) education program. The most important growth and development in the brain happens by the age of five. The early years are the learning years. A child’s ability to be attentive and to follow directions emerges in the early years. Structured early learning fosters these abilities for later success in school and in life. Pre-K prepares children to be ready for school. Children who participate in high-quality early childhood education programs develop better language skills, score higher in school-readiness tests and have better social skills and fewer behavioral problems once they enter school. They are also better prepared for Kindergarten, especially in the areas of pre-reading, pre-math and social skills. Pre-K promotes a love of learning in children. Pre-K enhances what a child learns at home and instills a love of life-long learning." Copyright 2017 Sunshine Academy, LLC. All rights reserved.